If you’re familiar with older versions of Microsoft Excel, EditGrid (www.editgrid.com) you’ll feel quite at home with EditGrid. 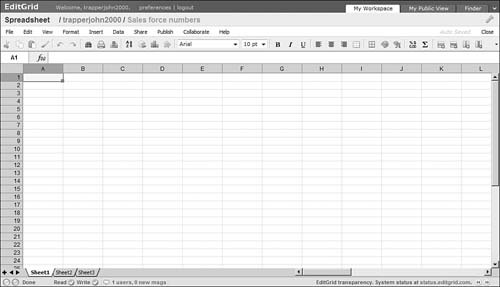 As you can see in Figure 4, the EditGrid interface is a near-replica of pre-2007 Excel, down to the tabbed sheets, pull-down menus, and toolbars. You even get 50+ keyboard shortcuts, identical to those in Excel. Figure 4. EditGrid—as close to Excel as you can get in a web-based app. Its web-based nature lets EditGrid add some unique features not found in Microsoft’s desktop-bound program. In addition to the expected sharing and collaboration features, EditGrid adds live chat, the ability to organize different spreadsheets and users into workspaces, and a remote data feature that lets you update your spreadsheets with real-time web data, such as stock quotes, exchange rates, and the like. The result is a powerful spreadsheet with a familiar interface—and like Google Spreadsheets, it’s completely free for individual users. 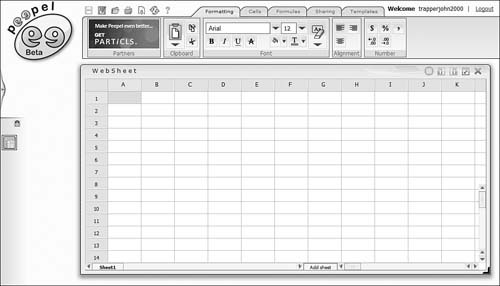 The eXpresso online spreadsheet (www.expressocorp.com), shown in Figure 5, offers basic spreadsheet features paired with advanced collaboration tools. The spreadsheet itself isn’t much to write home about; there are no functions, charts, or advanced formatting options. The collaboration features, however, include notes, email communication, online chat, and sophisticated sharing capabilities. This application is perhaps best used to first import existing Excel spreadsheets and then share them using eXpresso’s collaboration tools. Figure 5. 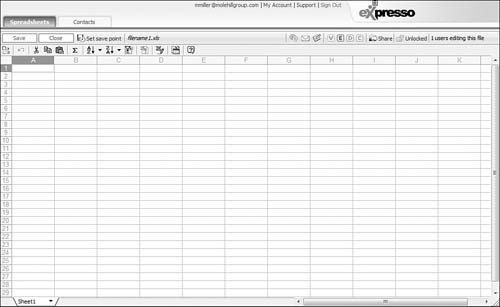 The basic spreadsheet interface for eXpresso. Glide Crunch (www.glidedigital.com) is, like the Glide Write word processor, part of the Glide Business suite of web-based applications. Glide Crunch itself isn’t web based; it’s a desktop app that installs on your PC’s hard drive. As soon as you’re connected to the Internet, however, Crunch gains web-based features and automatically syncs to the Glide Webtop. It also works on the iPhone and other mobile devices. 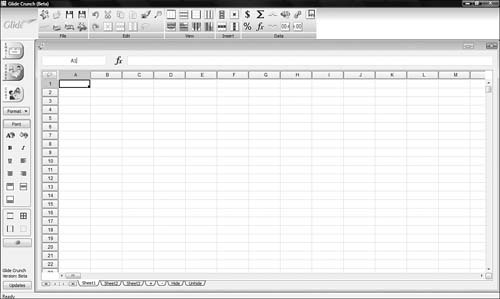 The Glide Crunch interface, shown in Figure 6, looks a little like the new Microsoft Excel 2007 interface, using ribbon-like groups of option buttons at the top of the screen. Crunch offers a bevy of Excel-like functions and a pivot table feature, but it doesn’t (as of May 2008) let you create graphs and charts—although this feature is sure to be implemented in later versions. Figure 6. Glide Crunch—a combination online/offline spreadsheet. The ability to create spreadsheets offline is a boon to users who don’t always have a stable Internet connection. When you do log on to the web, you get all the benefits of a web-based app—including sharing, collaboration, and file syncing. It’s certainly an approach worth considering. 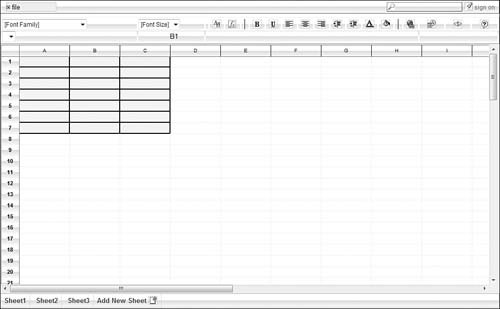 Num Sum (www.numsum.com) is a basic web-based spreadsheet application. As you can see in Figure 7, there’s nothing fancy here, just a typical spreadsheet workspace with editing and formatting buttons in toolbars above. Even though Num Sum does let you share and collaborate on your spreadsheets, the program includes no built-in functions and only three rudimentary chart types (line, bar, area), which makes it less than ideal for advanced spreadsheet users. Figure 7. Num Sum’s rudimentary spreadsheet interface. 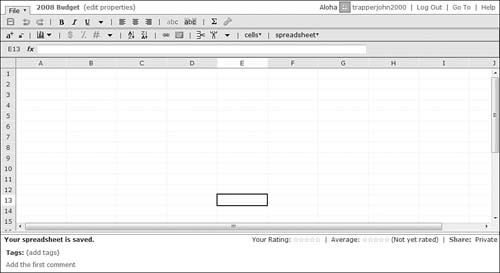 As you can see in Figure 8, the spreadsheet you’re editing appears in its own window, on top of the larger home window that holds the toolbar and tabs that you use to edit and format the spreadsheet. Yep, it’s the same quirky interface found in Peepel WebWriter; it’s just the way Peepel chooses to do things. Figure 8. The quirky interface of Peepel WebSheet. While WebSheet offers a nice selection of functions and formatting options, it doesn’t have a chart feature, so you can’t display your data visually. It does let you share and collaborate on your spreadsheets, but it’s not the most full-featured spreadsheet application available. Figure 9. Sheetster—another basic web-based spreadsheet.